A stage-struck small-towner is tricked in backing a bad straight play, but it turns out to be a unintentional comedy hit. Problems arise, when he is sued for plagiarism. Dulcy Ward: I'm sure there's no snake in YOUR bed! 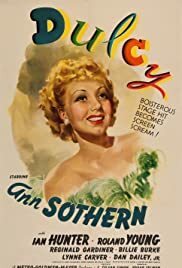 This is at least the third time that the stage play "Dulcy" by George S. Kaufman and Marc Connelly was made by MGM into a film. A silent featuring Constance Talmadge appeared in 1923. Version No. 2 appears under the title "Not So Dumb" in 1930 and features Marion Davies (directed by King Vidor). A CD version is available featuring Zazu Pitts in a 1935 radio broadcast and you can pull down off the internet a 1937 radio version with Gracie Allen. Dulcy must have been a real hit on the stage and I would expect that the Gracie Allen version was a hoot. I just did not think this was a slap on the leg comedy that aged well for viewers the 21st Century. The story's premise is that a scatterbrained young woman tries to turn a weekend social event into a business opportunity for her fiancé. Ann Sothern is a good actress but the material just does not seem quite as funny as it obviously must have decades ago. There are clever written gags and lots of physical comedy. The material has the actresses in the lead playing as if they were actually dumb - not just clever and using being dumb as a technique to get their way. Today we no longer find funny folks who are not that bright and who seem to glide through life oblivious to their situation. All ends well, despite Dulcy's efforts, and perhaps some of you will find this a pleasant diversion. Recommended for social scientists and anthropologists attempting to research what was funny to us when.